Trailing by 10 with 9:24 to go in the game, USD built a 18-3 run over the next six minutes to come away with a 76-72 victory over Oral Roberts in Tulsa, Okla. Friday night. The Coyotes overcame a fantastic shooting performance by ORU redshirt-senior Lakota Beatty. Beatty finished the game with 27 points, 24 of those points from behind the arc where she was 8-of-11 shooting. The third quarter gave Oral Roberts a shift of momentum heading into the fourth. Beatty splashed home six of her eight three-point baskets and the Golden Eagles outscored the Coyotes by nine in the quarter. The Coyotes found their rhythm in the fourth thanks to senior Allison Arens scoring 12 of her 26 points. Arens also led USD with seven rebounds. The comeback pushes the Coyotes to 16-3 overall and 4-1 in the Summit League. Junior Ciara Duffy tallied 25 points, including two huge free throws to extend the lead to four with six seconds left in the game. Junior Taylor Frederick added 10 points and four boards. 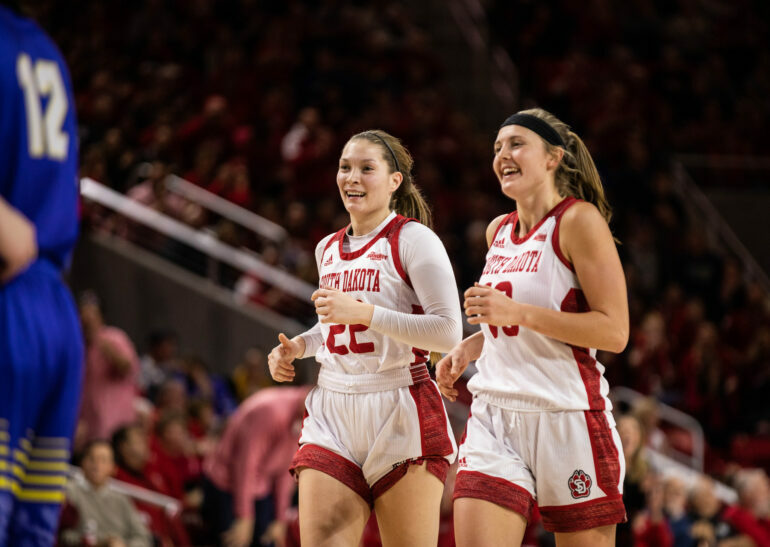 The Coyotes lost the field goal percentage battle (46.3-43.9) but USD was able to double up from the charity stripe, proving to be a huge advantage down the stretch. Sophomore Maya Mayberry scored 17 points to go along with Beatty’s 27. Oral Roberts’ loss drops them to 10-9 (3-3). The Golden Eagles make the trip to the Sanford Coyote Sports Center in February. The Coyotes next matchup is Sunday in Omaha, where they will take on the Mavericks at 2 pm. The game will be the first meeting this season for the two teams and is the first game of a doubleheader. The Coyote men play in the second game of the day. That game will start at 6 pm.